How to crochet a handbag with suzette stitch! Row 1: suzette stitch, 1sc into the 2st chain from hook, 1dc into the same chain, *skip 1, 1sc into the next, 1dc into the same chain*, repeat from * to * until 2 chains remains. To finish the row: skip next chain, 1sc into the last chain. Row 2: chain 1, turn, *1sc into the 1st stitch, 1dc into the same stitch, skip 1*, repeat from * to * until 2 stitches remains. To finish the row: skip next stitch, 1sc into the last stitch. Rows 3 - 52: repeat row 2. In the end of row 52 cut the yarn and finish your work. create a magic ring with 6sc. Round 1: 2sc in each stitch around. Round 2: *1sc into the 1st, 2sc into the 2nd* repeat from * to * around. Round 3: *1sc in each of next 2 stitches, 2sc into the 3rd stitch*, repeat from * to * around. Round 4: *1sc in each of next 3 stitches, 2sc into the 4th stitch*, repeat from * to * around. Round 5; 81sc in each of next 4 stitches, 2sc into the 5th stitch*, repeat from * to * around. Round 6: 1sc in each stitch around. Round 7: *1sc in each of next 5 stitches, 2sc into the 6th stitch*, repeat from * to * around. Round 8; *1sc in each of next 6 stitches, 2sc into the 7th stitch*, repeat from * to * around. Round 9: 1sc in each stitch around. Round 10: *1sc in each of next 7 stitches, 2sc into the 8th stitch*, repeat from * to * around. In the end of round 10 slip stitch to the 1st stitch, cut the yarn and finish your work. Join the sides; start from the beginning of the body& join the sides with 1sc in each stitch around. Row 1; 1sc into the 2nd, 1sc in each chain across. Row 2; chain 1, turn, 1sc in each stitch across. In the end of row 67 cut the yarn and finish your work. Sew the handles to the bag. 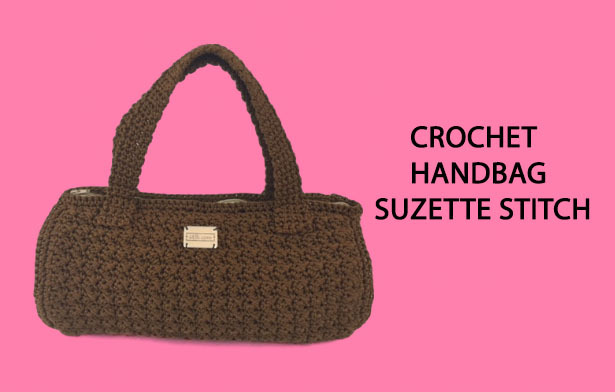 Watch my free video tutorial which shows you how to make this beautiful handbag with suzette stitch.